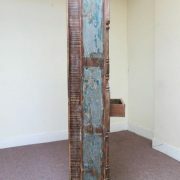 Large TV unit with carved front, made with reclaimed wood. 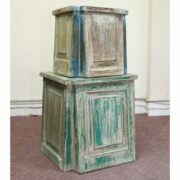 This large rustic TV unit could really make a special addition to your living room. 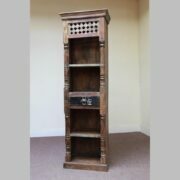 Made from reclaimed wood, the majority of its front frame and the edges of the cupboard doors are made up of ornate hand carvings, framing the piece wonderfully. Inside each cupboard is one internal shelf, creating two storage spaces which are perfect for your dads, games or other possessions. 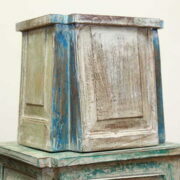 Between the two cupboards are two deep shelves for electronic appliances, these shelves have a darker finish unlike the rest of the cabinet which is finished with washes of distressed dark blue paintwork, giving it a rugged character. 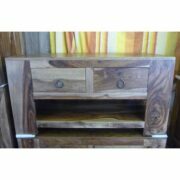 A really eye-catching yet functional and practical piece, this large TV unit would work perfectly for those who have a home cinema system or plenty of games consoles.